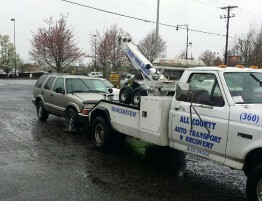 At All County Auto Towing in Vancouver, WA we want you to be prepared in an emergency. So here is a list of very important items everyone should have in their roadside emergency kit. 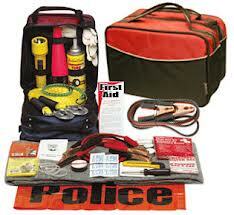 An emergency roadside kit should be tailor made just for you, your vehicle and the area that you drive in. We hope that you never need to use it but we want you to have it there just in case. Almost all vehicles come with these items for changing a tire. Refer to your owner’s manual on where they’re located in the vehicle and how to use them. Models that come with run-flat tires do not have a spare tire. Run-flat tires can be driven a limited number of miles with little or no air in them. They have very stiff sidewalls, which provide support when the tire is deflated. Learn more about the warning signs of imminent tire failure. It may also be a good idea to carry a cheater or breaker bar to slide over your lug wrench handle. 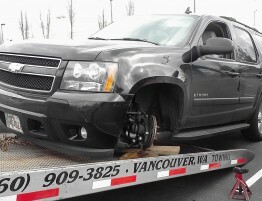 Many tire shops torque the lug nuts using pneumatic impact guns that tighten lug nuts very well, but make it extremely difficult to remove with the factory supplied lug wrench. For minor punctures, a foam tire sealant can get your vehicle back on the road quickly. Only use it in an emergency, however, as many tire shops will refuse to repair the tire because of the sticky residue these sealants leave inside it. Be sure to choose a sealant that’s labeled as non-flammable, and don’t consider this a permanent fix. A portable DC-powered air compressor can also be used to inflate a tire–and is especially handy for one that suffers from a slow leak. To fix a puncture, however, you need to have it professionally repaired. Do not attempt to fix a puncture in the sidewall, only punctures in the tread can be plugged. If your tire continues to leak but you can not find a puncture in the tire it may be the valve stem. You can check this by moving the valve stem around once you inflate the tire to see if air comes rushing out when pushed in a certain direction. Jumper cables are easy to use as long as you have a second car available to provide a jump. Refer to your owner’s manual for instructions. 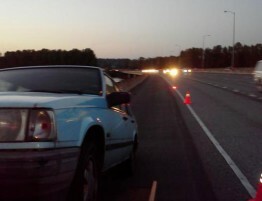 A portable battery booster eliminates the need for a second car. There are a lot of places that sell cheap versions of these two items. A good set of 8′(eight foot) jumper/booster cables should run at least $40.00. The cheaper ones will require a long period of time allowing the battery to charge before it will actually start. You can check the quality of the cables by the number of copper wire strands in each cable. Cables with a lot of small copper wires will carry much more current than cables with less and larger copper wires. A good battery jump/booster box will cost at least $100.00 when on sale. Regular pricing for jump boxes worth buying range from $130.00 to $400.00 depending on the size of vehicle you drive. Diesel pickups will require more power than a gasoline pickup for instance. Also, make sure that the jump box you choose has a replaceable battery. If you can’t see yourself spending the money on a box or do not know why they are so expensive think about the cost of the last car battery you bought. That is pretty much what is in the box along with cables and other extras depending on the box you get. Some boxes come with internal air compressors, A/C and USB charging ports which come in handy out on the road. If you belong to an auto club or roadside-assistance program, be sure you have the necessary information in your vehicle. Not all areas have contracted providers for every motor-club, including AAA. Although they do not like to, all motor clubs will reimburse you for if you pay out of pocket for you own tow. This is when the motor-club cannot find a provider, or the provider cannot get to you quickly enough. 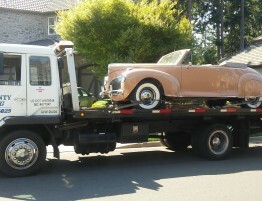 Not all local tow companies contract with motor-clubs for various reasons. For long trips, especially those through remote areas, add these items to your basic emergency kit. If your route will take you into an area where cellular service is spotty, consider a portable or in-car CB radio. This is an optional item, but good to have when traveling to new places. For the cold, wet conditions of winter, you may need additional items in your emergency kit, especially if you travel in remote areas or in severe conditions. Good visibility is your most important safety item, but persistent snow and ice can build up quickly and make it hard to see. A long-handled, soft-bristled brush can also come in handy. 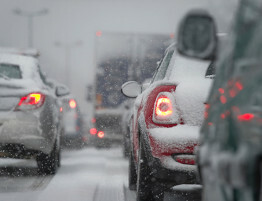 Familiarize yourself with how to put the chains on your vehicle’s tires or attach a tow strap before you need to do it in cold and possibly dark conditions. If you get stuck or slide of the road a bit a come-along and chain, cable or strap will come in handy to get you back on the road. Sometimes if there is quite a bit of tension on the cable, chain or strap put a folded blanket or jacket on the middle of the cable. This way, if it happens to break it shouldn’t snap back causing injury or damage. If you run out of fuel or if your battery dies, the vehicle won’t be able to provide heat. A blanket and hat can help keep you warm if you have to wait for a long time in cold conditions. These small, inexpensive packets are available at ski shops and sporting-goods stores. If you get stuck in snow, this can be a vital tool. A folding camping-style shovel will require more digging effort than a longer-handled shovel, but is more convenient to store in the vehicle. 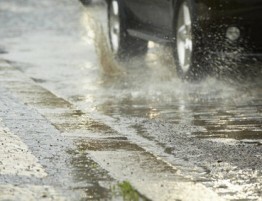 This can help provide some traction on an especially slick road surface. 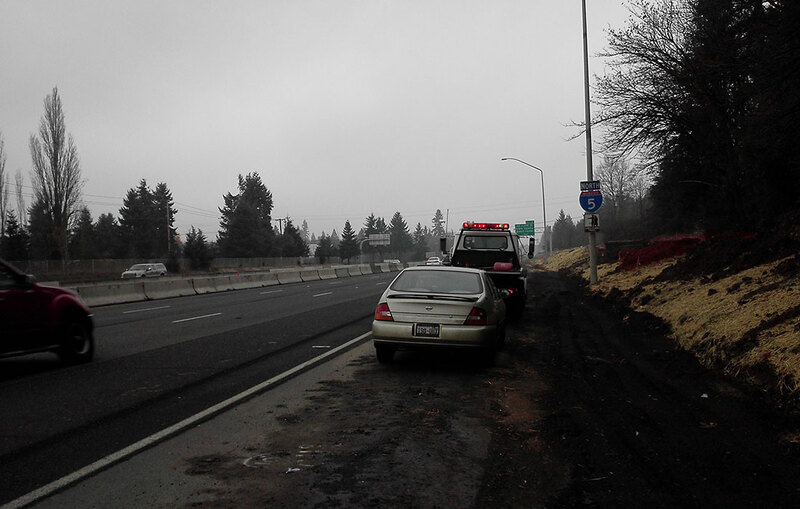 All County Auto Towing in Vancouver Washington is here to lend a helping hand whenever possible. We hope that this helps you stay safe out on the road. 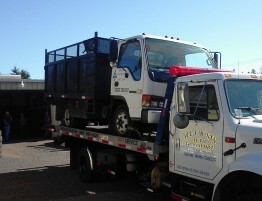 If you are ever in need of service just give us a call day or night, we will be ready to assist you. 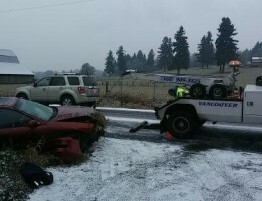 Please Drive Safe and Enjoy the Road.